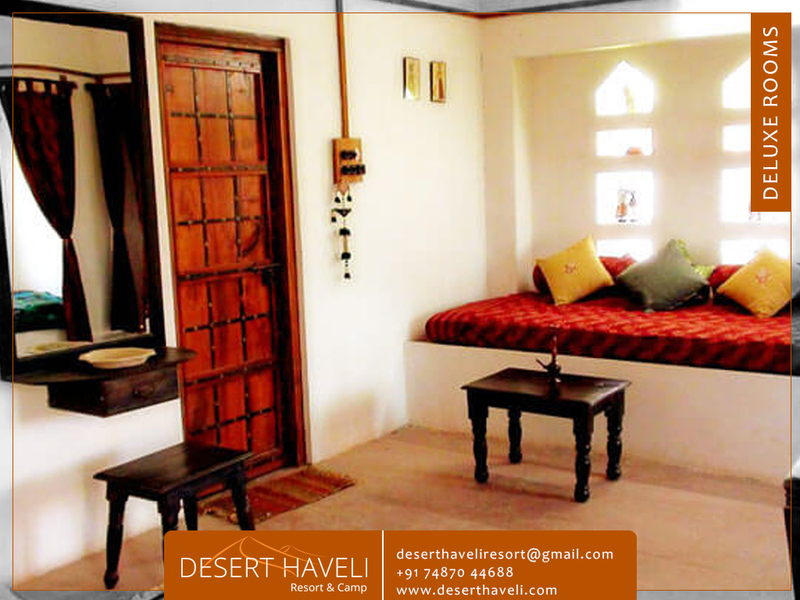 Desert Haveli Resort & Camp Jodhpur is situated between Jodhpur and Jaisalmer near Dechu. It is an ideal place in the desert of Thar in Rajasthan and one of the best hotels in Jodhpur. This place makes you revive the vibes of Rajasthani culture, heritage, customs and traditions. The surrounding atmosphere is rural and vibrant. You can feel the peace and tranquility here. Birds and the animal’s sounds will be the only sound you would listen here, there won’t be any traffic, or industry noise or any pollution of vehicles will be seen here. All you can see and feel will nature and its beautiful creations. It is a perfect place for those who want to spend their holidays in the arm of nature and that’s why known as best resorts in Jodhpur. This property gives you the special feeling and immense love plus care which you will definitely not get at any of the heritage hotels of Rajasthan. Here personalized guest care is given with gracious hospitality services. 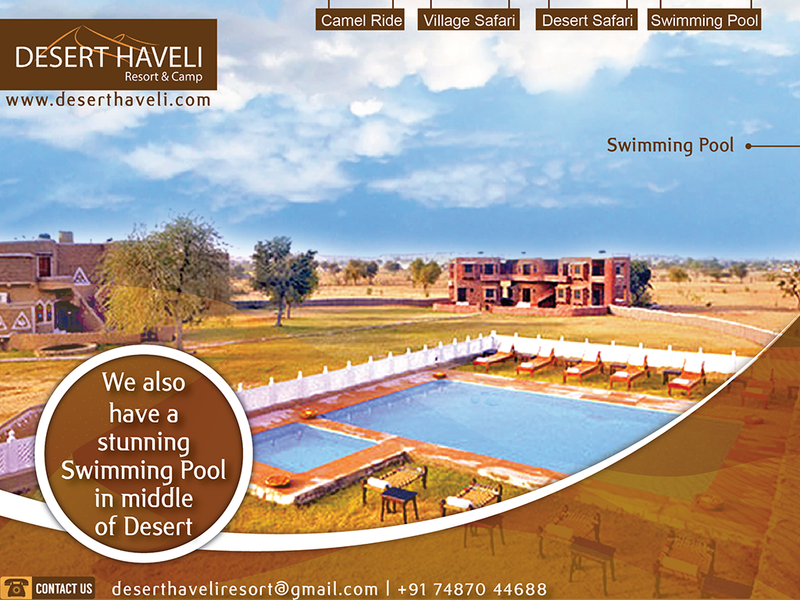 And you can get all of it by just simply doing hotel booking Jodhpur in The Desert Haveli and Resort Camp. There are different kind of packages available for leisure travelers. They are mainly of 3 days – 2 nights packages, including 1 night stay in resort and 1 night stay in tents, or you can also opt for 2 night in luxury tents package. There are 3 types of packages named as silver, gold and platinum. 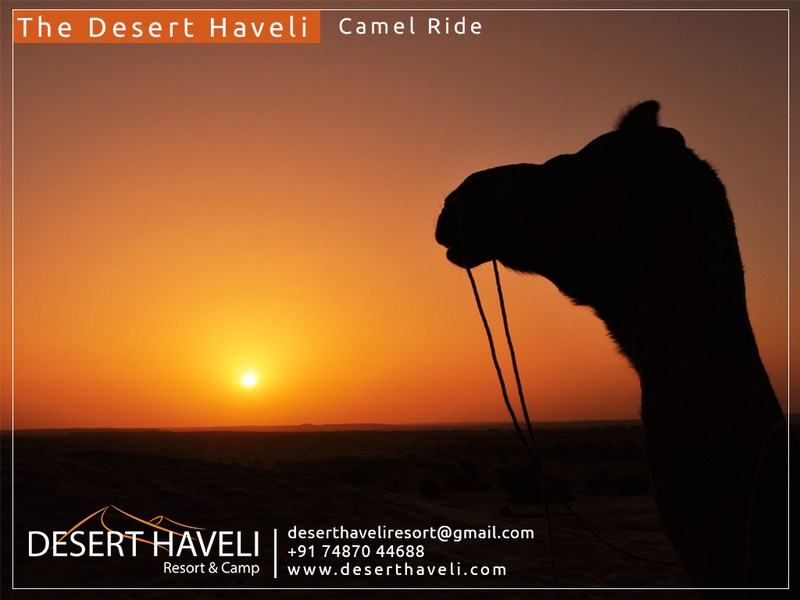 All the packages are inclusive of Non-alcoholic welcome drink on arrival, Complimentary water bottle, Tea/Coffee maker in the rooms, Cookies/biscuits in room, Running Hot & Cold water, Breakfast, Lunch & Dinner, Camel Ride [near by dunes], Jeep Safari [near by Villages & Dunes], Free pick up/drop to camp from resort. There are so many activities available for your fun filled stay at the desert safari Jodhpur. You can go for camel safari Jodhpur and even enjoy the bird watching at the same time. It is the perfect option to spend your time in the real desert between the sand dunes.You can also go for jeep safari Jodhpur during your stay. There are few other options also available like village safari or khichan safari where you can feel the rural beauty of Rajasthan with the diversity among it. You can also see the proud local tribes Bishnoi, Bheels, Shepherds, Potters, and Weavers etc. While Khichan safari is a heaven for every bird lover. You can get the treasure of lifetime by experiencing it. During the stud farm visit you can see the different variety of horses and even get a chance to ride them. You can also visit the Desert haveli’s own farm where you can get relaxed in the open fields and later you can enjoy the mouth watering local delicacies prepared by their local chef. In short it will be an overwhelming experience for you.